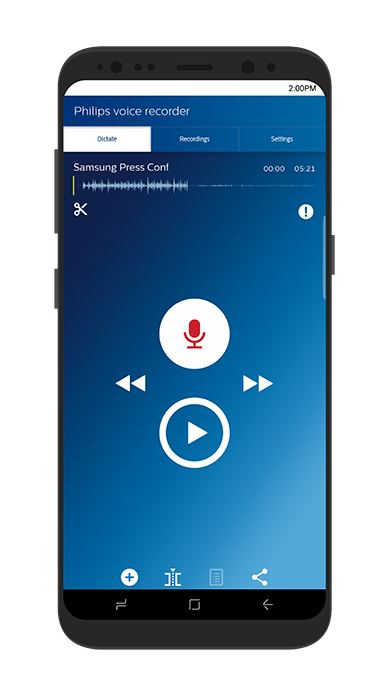 When Philips approached me about giving their voice recorder app and SpeechLive cloud service a try, I jumped at the opportunity. I’d just received an invitation to NYC to cover one of the biggest phone launches of the year, the Samsung Galaxy Note 8. I wanted to see how much these tools could help speed up my writing process and create an article covering the launch. The experience and results were pleasantly surprising! During the press conference, I used the Philips voice recorder app for Android to capture quotes. The app’s design is dead simple and intuitive to use. It’s broken up into three tabs: Dictate, Recordings, and Settings. The Dictate tab puts every recording and editing feature at your fingertips. The Recordings tab shows a list of your dictations and their status. The Settings tab lets you set when dictations are purged, change sending preferences, and customize workflow labels. 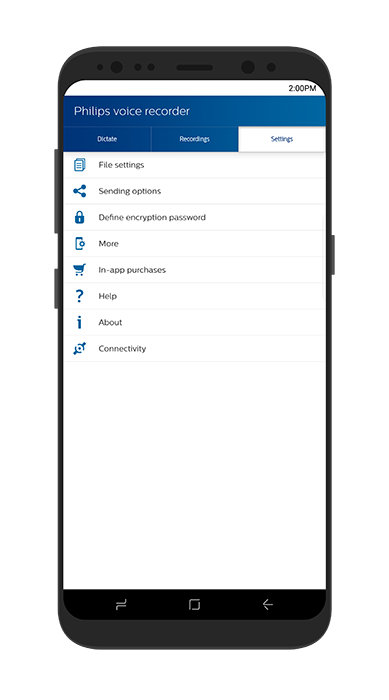 The design of the app feels conventional and barebones, but it packs a lot of power under its simple appearance. Everything I needed was only a tap or two away, including customizable shortcuts at the bottom of the Dictate tab for quick access to different actions. Capturing quotes on my phone using the app was also easy. I started a new recording from the app, then moved on to take pictures and live tweet the event. Occasionally, I would jump back into the app to pause or resume recording. After the press conference, I went to the library to dictate a rough draft of my article. I was surprised by how many editing features the app provided. From the Dictate tab, I could overwrite, cut and append to the same recording until I was satisfied. I only wish I could’ve worked with a more detailed view of the recording for greater precision while editing. Still, I had a rough draft ready to be transcribed within 30 minutes (10 minutes recording, 20 minutes editing). There are three options for transcribing dictations through SpeechLive: a professional transcription service, speech recognition, and the ability to use your own transcriptionist or type it up yourself. I used SpeechLive’s professional transcription service to transcribe the dictation of quotes and the software-based speech recognition service to transcribe my article. I conveniently received each transcription via email and within the app, attached to their respective dictation. SpeechLive’s professional transcription service was 100% accurate. To my surprise, the transcriptionist managed to catch each speaker’s name in the dictation and labelled their sections accordingly. I only wish I would’ve marked this dictation’s priority as high to take advantage of SpeechLive’s 5-hour turnaround time instead of the standard 24 hours. SpeechLive’s speech recognition service returned a transcription for my 5-minute dictation within 30 minutes. Minor mistakes were made throughout the transcription, but it provided a great starting point to flesh out the rest of my article. 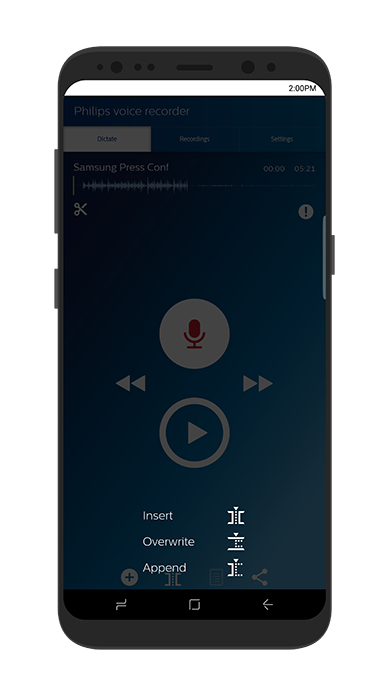 Overall, the voice recorder app in combination with SpeechLive is a great dictation tool. It has all the essentials for dictation and no bloat. My productivity during the press conference was greatly increased and I went from rough draft to full article with two days. The immediate access to dictations and transcriptions within the app and on the SpeechLive website ensured I always had the information I needed no matter where I was. I really enjoyed using the app and SpeechLive transcription services and look forward to using it to create more articles.